David Whitlock, Oklahoma Baptist University President, speaks at the BGCO Board meeting. DAVIS—Members of the Board of Directors of the Baptist General Convention of Oklahoma (BGCO) met at Falls Creek Baptist Conference Center Sept. 10-11 for their final board meeting of 2018. Many board meeting reports shared success involving Oklahoma Baptists this year, as well as some elements of preparation for 2019. Falls Creek reported more than 59,000 registered participants attended the eight summer youth weeks, which is the highest attendance recorded in the encampment’s history. The Falls Creek program staff recorded 2,173 professions of faith in Christ and 5,008 overall spiritual decisions were made during the eight weeks of youth camp. Chris Fields, pastor of Clinton, First and chairman of the BGCO Equipping Committee, reported Falls Creek will have new camper safety policies beginning in 2019, which will be communicated to churches in the near future. “This plan will set the foundation and focus for our work in the coming years and better position us to support and challenge one another to advance the Gospel in our state and around the world,” Dilbeck said. Dilbeck finished his address, referencing previous board meeting reports in BGCO history. He also declared what future Oklahoma Baptists would be able to read about this meeting. Board members then divided into smaller groups and spent time praying. BGCO Board members approved a recommendation that was jointly submitted by the Executive Committee and the Finance Committee regarding the Baptist Messenger. 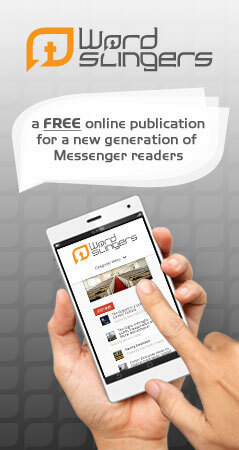 The Messenger will remain a weekly publication until January 2019. For more information on this publication change and other news relating to the new schedule, see the article above. The 2019 BGCO Cooperative Program (CP) objective of $25.5 million was adopted by Board members. In the event CP giving in 2019 does not reach the budgeted objective distribution to the BGCO, affiliates and the Southern Baptist Convention will be proportionately adjusted. Dilbeck announced in his comments to the Board this is a one percent reduction from the 2018 budget. Joe Ligon, pastor of Marlow, First, will complete his role as BGCO president at the 2018 Annual Meeting, Nov. 12-13, at Edmond, First. As he completed his duties of overseeing the recent Board meeting, Ligon spoke on his two years of service as BGCO president. Robert Kellogg, president of The Baptist Foundation of Oklahoma, gave a report of the Foundations’ involvement with church loans. For 2018, Kellogg said the Foundation approved 28 church building loans in the amount of $24.9 million, with another 16 loans in the amount of $20.5 million. Kellogg reported on a separate church-extension fund called Water’s Edge, which works with Baptist entities outside of Oklahoma. Kellogg also shared how Water’s Edge got its name. “In the New Testament, every time we see our Lord on the water’s edge, He was followed by ministry and miracles, and that’s what we want to be a part of,” he said. Bill Pierce, president of Baptist Village Communities (BVC), reported that BVC is celebrating 60 years of ministry. He also shared all nine BVC licensed communities received “zero deficiencies” from the Oklahoma Board of Health surveys this year. David Whitlock, president of Oklahoma Baptist University (OBU), shared OBU has experienced remodeling on campus. He reported the Agee Residence Center (formerly known as Brotherhood Dormitory) now has new painting and flooring on every hallway and in every dorm room. The Geiger Center, Whitlock said, now houses the Spiritual Life Office which was previously located in Montgomery Hall. “This puts (the Spiritual Life Office) right in the heart of the campus, along with the rest of the student development staff on the first floor of the Geiger Center, the student union building,” Whitlock said. 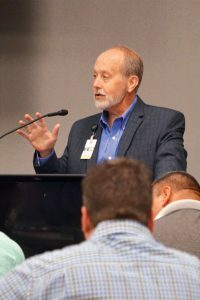 Greg McNeece, president of Oklahoma Baptist Homes for Children (OBHC), emphasized OBHC’s foster care program, One Such Child, in his report, stating the program, in the first six months of 2018, has helped 150 Oklahoma Baptist churches either to begin or enhance existing foster care ministries. The next BGCO Board Meeting will be Feb. 5, 2019, at the Baptist Building.